The R-31 CB shares many of the features and qualities of her smaller sisterships but some notable additions to this larger model make her ideal for extended cruising while still being a trailerable trawler. The R-31 CB is the first Ranger Tug to feature a flybridge equipped with electronic controls at both the upper and lower helm. The flybridge also retracts to allow for trailering the 31’. 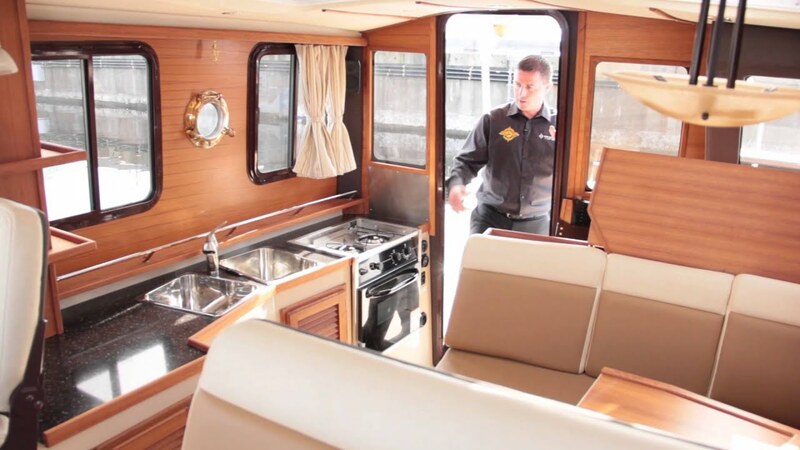 The builders at Ranger Tugs also equipped the foredeck with seating and a table that can be raised or lowered depending on whether the boat is under way or at anchor or dock for entertaining. In addition to the extra seating now available on the flybridge and foredeck the R-31 CB allows for a larger cockpit area with wraparound seating and extra seating that folds out of the gunwale. When not entertaining, seats are folded leaving the cockpit unencumbered. Like all Ranger Tugs, the new R-31 CB comes essentially turnkey with standard features and equipment intended to make her owner’s experience hassle-free and allow for ease of handling and comfort under way. Standard equipment includes bow and stern thrusters, an optional aft steering station and a Volvo D4 300hp engine that achieves a 16 knot cruise speed. Trailerable (Flybridge retracts for trailering).